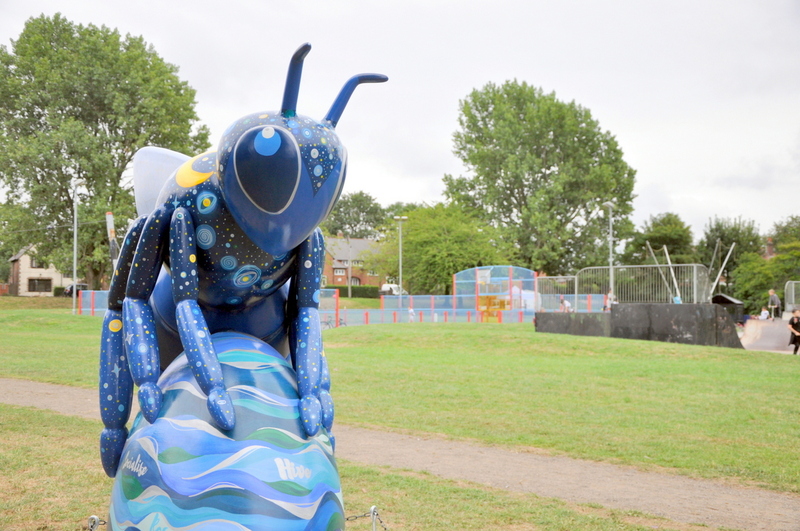 Our academy is proud to have been one of the sponsors of ‘Bee Blackley’: a major new sculpture for Plant Hill Park. It was officially unveiled at a Family Fun Day at the park on Tuesday 24 July 2018. Bee Blackley was part of the Bee in the City sculpture trail, which ran between July and September. Over 100 Bees waited to be discovered on this free, family-fun trail, taking in the city’s landmarks and undiscovered gems. Each Bee has been designed by a different artist and celebrates the unique buzz of Manchester, from its industrial heritage to its vibrant music scene. Whilst most of the bees were auctioned off for the Lord Mayor’s charity in October, Bee Blackley is one 23 community bees which will remain on permanent display. Students from the academy met local artist Lizzie Chapman at the warehouse where Bee Blackley was painted and they also had the chance to imagine their own designs in a workshop run by the artist at the academy. The final design of the bee is a joint effort of local community groups from the neighbourhood. Welcome to Blackley – greenest and highest of Manchester’s neighbourhoods. Up here we can touch the moon and the stars which control the tides and set the patterns of our days. Students travel to and from school and adults commute to work. The bees come and go from their hive. The seasons turn and the flowers blossom again and again. Welcome to Blackley – only a few miles from the city centre, and yet so full of inspiring greenery. Up here we can admire our city’s skyline and see the bigger picture. We co-operate and thrive, like our bees.